Your friend gets a 7.5% discount voucher for use on their first order. When your friend redeems their discount code, you get €10 worth of loyalty points added to your account. Your friend must spend a minimum of €30 to get this offer. Thats it! We will do the rest. An email will be sent to your friend with their unique discount code worth 7.5%. Your friend then places an order on the www.fitnessireland.ie website within the next 60 days to obtain their discount. Once their order has been verifed and despatched, you will receive 1000 loyalty points in to your account. All referrals are subject to verification. Referred friend must be a first time user of www.FitnessIreland.ie and has not made any purchase from the website previously, including under a different user account. Your friend must redeem their discount within 60 days in order to obtain the discount and for you to receive your points reward. 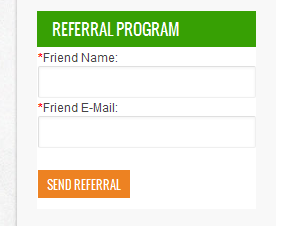 You can send a maximum of 5 friend referrals in 24 hours. Referring yourself in order to receive rewards is strictly prohibited. All accounts are subject to verification. Offer applies to online sales only. Discount code cannot be used in conjuntion with any other discount code offer. We reserve the right to end the Refer-A-Friend program at anytime without notice.